We announced the placement of a new Visiting Scholar, Eryk Salvaggio, at the John Nicholas Brown Center for Public Humanities and Cultural Heritage at Brown University. Eryk will be using the university’s resources to improve topics on an important academic subject that’s underdeveloped on Wikipedia, ethnic studies. Wiki Education staff presented about our programs at several events across the country, including conferences and workshops at the University of California, Berkeley, Xavier University of Louisiana, Louisiana State University, Fordham University, Diablo Valley College, and the Fashion Institute of Technology. Northeastern University Visiting Scholar Rosie Stephenson-Goodknight brought nine articles about women writers up to “B-class,” a level of quality only 2.7% of articles meet. After working with us as an interim Content Expert in March, Shalor Toncray joined us this month in a full-time capacity. In her role as Content Expert, Shalor supports classes in the humanities and social sciences. Early in the month, Outreach Manager Samantha Weald and Classroom Program Manager Helaine Blumenthal attended the Teaching History in the 21st Century conference, hosted at the University of California, Berkeley. 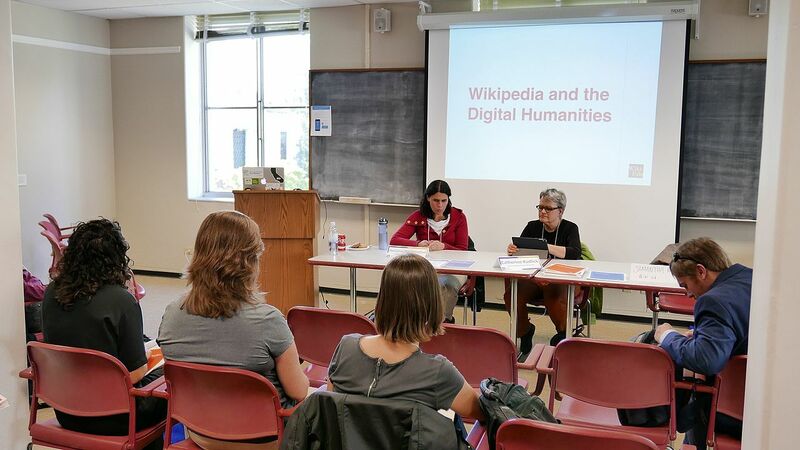 We presented alongside Catherine Kudlick, Director of the Paul K. Longmore Institute on Disability and Professor of History at San Francisco State University, about teaching with Wikipedia assignments in the history classroom. Educational Partnerships Manager Jami Mathewson and Samantha visited Louisiana to join faculty at various universities in the area. At Xavier University of Louisiana, a group of instructors will work together in a faculty learning community in the academic year 2017–18. Their theme for the year is “Making knowledge public using educational technology,” so several of them will be incorporating Wikipedia assignments into their classes. Jami and Samantha joined for a two-day workshop about assignment design, understanding Wikipedia, and how to make the most of Wiki Education’s tools. Since Xavier University paid to bring Wiki Education’s staff to campus, we took the opportunity to visit nearby Tulane University and Louisiana State University. 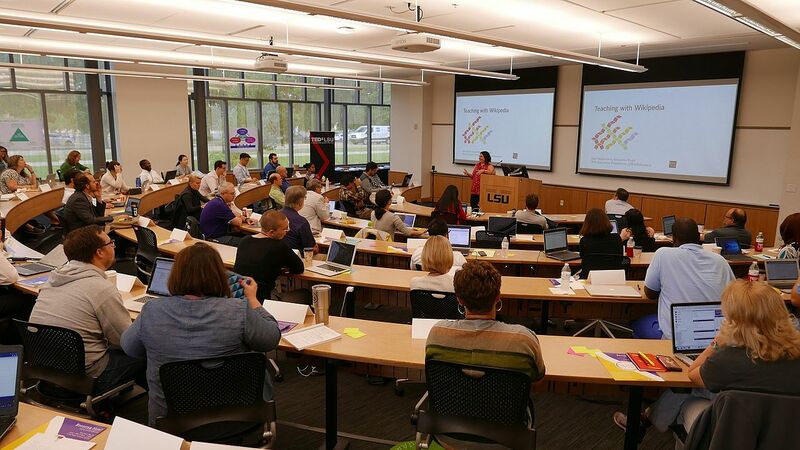 Samantha presented to instructors at Tulane, and we joined LSU’s Summer Institute, run by our partners from Communication across the Curriculum. 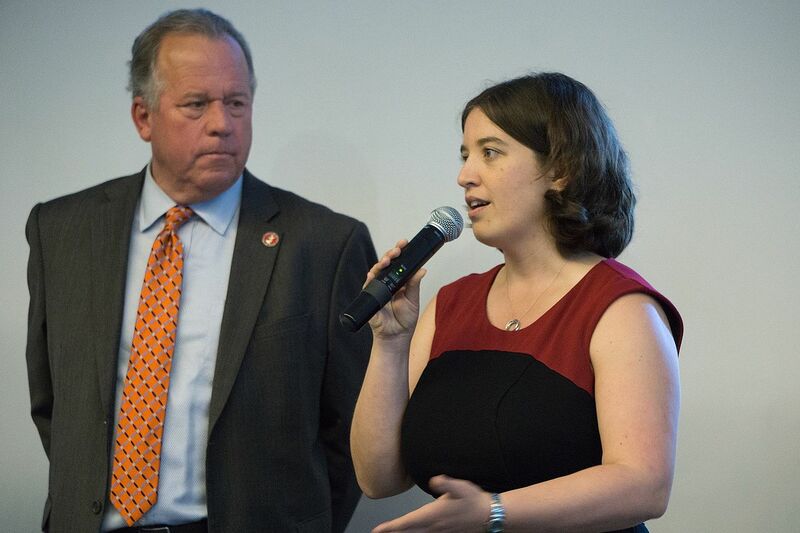 The following week, Samantha was a keynote speaker at Fordham University’s Faculty Technology Day. She presented about how Wikipedia assignments can develop students as digital citizens. Attendees learned about digital literacy and how they can enhance their pedagogy to build this skill in the classroom. We’re excited to work with more instructors who value media and digitally literate students as we continue supporting them in the Classroom Program. 64% of students were up-to-date with the student training. Students edited 9,030 articles, created 814 new entries, and added 5.87 million words. Though a number of courses on a quarter system are still active on Wikipedia, the vast majority of our Spring 2017 cohort have completed their Wikipedia assignments. With the summer approaching, the Classroom Program team will be evaluating how we did during Wiki Education’s most successful term to date. While growth is certainly one marker of success, we want to ensure that we continue to improve the quality of both our support and our students’ Wikipedia contributions. Toward this end, Helaine will spend time this summer reflecting on what went well during the Spring 2017 term and what projects and procedures are worth revisiting. In particular, we’ll be looking at ways to provide better support for the grading and assessment of Wikipedia assignments as well as thinking about how to best support different assignment types and class structures. We’ll also evaluate the success of Wiki Education Office Hours, an initiative we launched in Fall 2016 to provide instructors with an opportunity to interact with Wiki Education staff on a monthly basis using a video conferencing platform. We want to make sure that the support we offer is useful to our instructors as well as our staff, and the summer is an ideal time to examine our current practices and implement any changes for the Fall term. We will also be looking closely at the results of our Spring 2017 instructor survey to refine and expand our materials and resources. A student in David Sartorius’s History of the Caribbean class wrote an article on coartación, a system of manumission — where a slave owner frees his slave(s) — in Latin American slave societies. During this process, slaves would make a down payment to their owner and set a price for the cost of their freedom, conferring on them the status of “coartado.” The slave owner would then be unable to raise the price for the coartado’s freedom, nor could they treat a coartado as they would other slaves, effectively limiting or restricting the owner’s power. Coartados were granted special rights and privileges, such as receiving a portion of any money the master received for renting the coartado to others for work. Owners were also obligated to pay for the support of the coartado until they paid off the total cost of freedom. It was more common to see women and urban slaves seek manumission, as it would often be easier for them to gain outside employment. Carie King’s class on Advanced Writing and Research chose to work together on a single article: Danforth Chapels. These chapels were created using funding provided by the Danforth Foundation, which was created in 1927 by William and Elizabeth Danforth, the former of whom co-founded the Ralston Purina Company. Twenty-four chapels were built across the United States, fifteen of which were built on colleges and universities, with the first constructed in 1941. The Danforth Foundation had only three requirements for the chapels: they must include religious imagery, they must have a plaque with the inscription “Dedicated to the worship of God with the prayer that here in the communion with the highest those who enter may acquire the spiritual power to aspire nobly, adventure daringly, serve humbly.”, and the Danforths must be allowed to have a say in the chapel’s design. While the chapels tended to focus predominantly on Christian iconography, the chapels were also designed to accommodate other faiths. Out of the twenty-four chapels built, three have been torn down to make way for other buildings and two have been designated National Historic Landmarks. 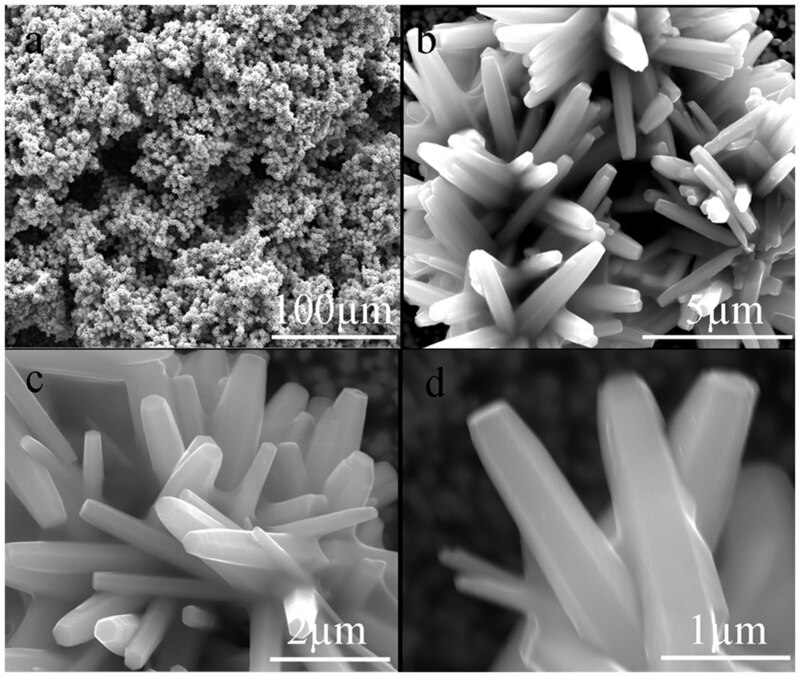 FE-SEM images of a hierarchical synthetically made ZnO film (from the self-cleaning surfaces article). Image: Journal.pone.0014475.g001.tif, by Jun Wu, Jun Xia, Wei Lei, & Baoping Wang, CC BY-SA 4.0, via Wikimedia Commons. While self-cleaning surfaces sound like something a person who hates housework might dream up, they constitute a real class of natural and synthetic materials. Natural materials in this category include lotus leaves, butterfly wings and the feet of geckos. There was no Wikipedia article about this topic until it was created by students in Edmund Palermo’s Biology in Materials Science class. And if self-cleaning surfaces sound like science fiction, four-dimensional printing might be even more challenging to wrap your mind around. Created by another group of students in the class, the article explains that 4-D printing is a form of 3-D printing that incorporates the ability to transform after they have been printed, in response to certain circumstances. Bioglass 45S5 is a form of glass that can be directly bonded to bone. It can be used to reconstruct and regenerate bone and tooth enamel. Students made substantial improvements to the article by expanding it and reworking parts of it. Resilin, a protein produced by insects and other arthropods, is the most efficient elastic protein known. A student group expanded a short, three-paragraph article into something substantial by adding sections about the occurrence of the protein, its amino acid structure and composition, potential clinical applications, and work with the protein in genetically modified organisms. Other student groups substantially expanded the limpet, natural fiber, fibril, trabecula, surgical mesh, and soft robotics articles. Image: Eryk Salvaggio.jpg, by Owlsmcgee, CC BY-SA 4.0, via Wikimedia Commons. May began with the announcement that the Deep Carbon Observatory would be sponsoring a Visiting Scholar. The Deep Carbon Observatory is an interdisciplinary initiative through which about 1,000 chemists, physicists, geologists, and biologists from 35 countries explore the quantities, movements, forms, and origins of carbon deep within Earth. As part of its commitment to disseminate knowledge with the broader science community and with the public, we’re excited that it will facilitate the improvement of deep carbon-related subjects on Wikipedia through the Visiting Scholars program. See Community Engagement Manager Ryan McGrady’s blog post announcement for more information. We also announced the placement of a new Visiting Scholar at Brown University’s John Nicholas Brown Center for Public Humanities and Cultural Heritage, Eryk Salvaggio, who edits as User:Owlsmcgee. Regular readers of these reports or our blog likely recognize Eryk’s name from his tenure as Wiki Education’s former Communications Manager. He has previously made substantial contributions to a number of articles on Japanese culture, women in the arts, and political prisoners, and will be using Brown’s resources to improve Wikipedia’s coverage of an important academic area: ethnic studies. Read more about this Visiting Scholars collaboration in our blog post. 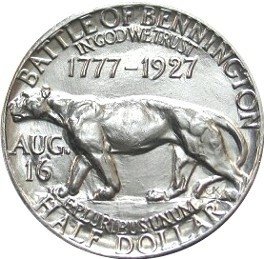 Image: Vermont battle bennington sesquicentennial half dollar commemorative reverse.jpg, public domain, via Wikimedia Commons. Existing Visiting Scholars continued to make excellent contributions to Wikipedia. George Mason University Visiting Scholar Gary Greenbaum brought two articles up to Wikipedia’s highest level of quality, Featured Article. The Vermont Sesquicentennial half dollar is a commemorative fifty-cent coin struck in 1927, marking the 150th anniversary of Vermont’s independence. The coin’s obverse depicts Vermont leader Ira Allen and the reverse, controversially, includes an unspecified big cat. Palsgraf v. Long Island Railroad Co. was a 1928 case concerning the question of liability to an unforeseeable plaintiff. When railroad employees helped two men board a train, one of the men dropped a package which exploded, causing a large scale to hit Helen Palsgraf. Palsgraf sued the railroad company, winning $6,000 from a jury. The decision was upheld on first appeal, but overturned when the company appealed a second time. Chief Judge Benjamin Cardozo wrote that the employees did not have a “duty of care” to Palsgraf because they could not have foreseen the harm when assisting the man with the package. Image: ELLA MARIA DIETZ CLYMER.jpg, by Frances Elizabeth Willard, public domain, via Wikimedia Commons. Northeastern University Visiting Scholar Rosie Stephenson-Goodknight is a prolific Wikipedian. This month she created or improved many articles on women writers, including nine “B-class” articles, which places them in the top 2.7% of all articles by quality. Emma Augusta Sharkey (1858-1902) was a writer, journalist, dime novelist, and storyteller who was one of a small group of women writers of her era who earned more than $6,000/year for her writing. Florence Huntley (1861-1912) was a journalist, editor, humorist, and occult author from Ohio. 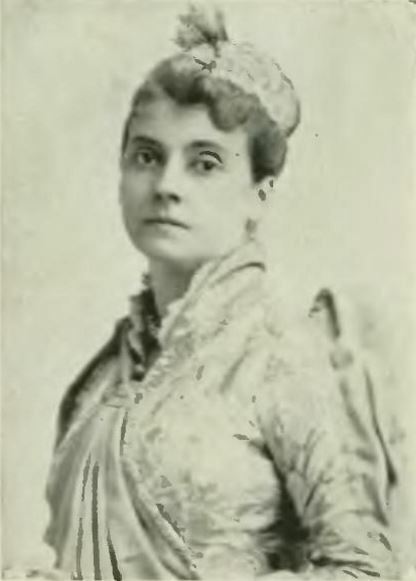 Ella Maria Dietz Clymer (1847-1920) was an actress and poet in New York City best known for her time as president of the women’s club Sorosis. Hattie Tyng Griswold (1842-1909) was a Massachusetts-born author and poet known for works like Apple Blossoms, Waiting on Destiny, Lucile and Her Friends, and The Home Life of Great Authors. Using pen names “Australia” and “Lucrece,” Cora Linn Daniels (b. 1852) was an author, editor, bibliophile, and Fellow of the Royal Asiatic Society of Great Britain and Ireland. Harriett Ellen Grannis Arey (1819-1901) was an educator, author, editor, and publisher from Vermont. Ellen Russell Emerson (1837-1907) was an author and ethnologist from Maine who became the first woman to be an elected member of the Society Americaine de France. Lucinda Barbour Helm (1839-1897) was an author, editor, and religious activist from Kentucky who founded the Woman’s Parsonage and Home Mission Society of the Methodist Episcopal Church South. Louise Manning Hodgkins (1846-2935) was an educator, author, and missionary newspaper editor from Massachusetts who taught at Lawrence College and Wellesley College and served as editor of The Heathen Woman’s Friend. In early May, Director of Programs LiAnna Davis was invited to speak at Diablo Valley College in Pleasanton, California, on the topic of fake news. LiAnna was joined on the panel by East Bay Times education reporter Sam Richards, UC Berkeley e-learning and information studies librarian Cody Hennesy, California State Senator Bill Dodd, and student trustee Kwame Baah-Arhin. The panel was well received, and a video of it is available. Later in the month, Ryan was invited to organize a session, “Integrating Wikipedia into the Curriculum,” at the Fashion Institute of Technology’s Adjunct Summer Institute in New York. Ryan was joined by two other Wiki Education program participants, Iris Finkel of Hunter College and Anne Leonard of the New York City College of Technology, who shared their experiences assigning students to contribute to Wikipedia and Wikimedia Commons. Also in May, Ryan and Helaine sent out the fourth monthly newsletter to program participants. We piloted the newsletter as a way to stay in touch with instructors, disseminate information about ways to get involved, build community by sharing instructor publications and activities, and otherwise provide an update of what’s going on at Wiki Education. The final newsletter solicited survey responses to gauge its effectiveness and determine whether we should continue the project in the next fiscal year. With a support contract from the Wikimedia Foundation, we also started work in late May on a set of bug fixes and design improvements that affect the Wikimedia Programs & Events Dashboard, a fork of the Wiki Education Dashboard software. Beginning May 30, Product Manager Sage Ross, along with Wikimedia Foundation Design Researcher Jonathan Morgan, is mentoring three summer interns — Sejal Khatri, Keerthana S., and Medha Bansal — for design and coding projects to improve the Dashboard. Research Fellow Zach McDowell finished writing a white paper summarizing the Student Learning Outcomes Fall 2016 research, along with preliminary analysis. Along with the white paper, Zach has prepared the data for release, including codebooks, sample analysis, and data visualization. The report is in final draft form as of the end of the month, for release in June. In addition, Zach is preparing to give a talk at the New Media Consortium conference in Boston on June 14 along with Joseph Reagle on the research. Research Assistant Mahala Stewart wrapped up her contract with us at the end of the month. Mahala was a great help with Zach’s analysis work, and we thank her for her help and wish her the best. 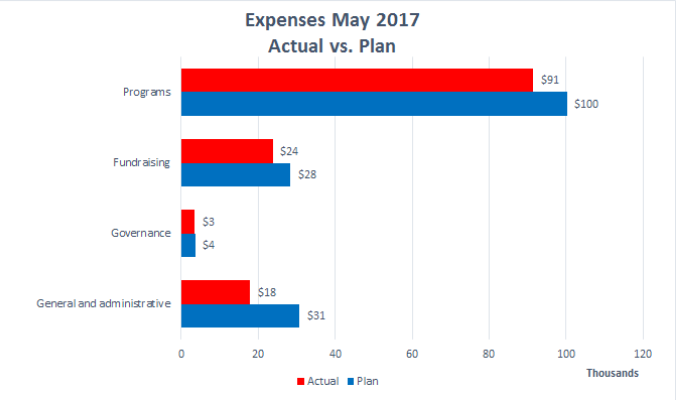 For the month of May, our expenses were $136,618 versus our approved budget of $162,925. The $26k variance is the net result of continued savings in staffing vacancies ($30k) and travel ($7k) offset by the timing of Professional Services ($15k). Our year-to-date expenditures were $1,623,232. We continue to be well below our budgeted expenditure of $2,081,427 by $458k. As with the monthly variance, a large portion of the variance is a result of staffing vacancies ($226k), as well as additional savings in Professional Services ($53k); Travel ($95k); Marketing and Fundraising Events ($30k); Board and Staff meetings ($46k); Staff Development ($26k); and Printing ($19k). These were slightly offset by higher expenditures for temporary help ($13k); additional rent ($21k) and unforeseen government filing – legal fees ($10k). In May, Wiki Education received a $99,996 grant from the Wikimedia Foundation as part of their Simple Annual Plan Grant funding. The grant covers the time period of May 1 to September 30, 2017. Executive Director Frank Schulenburg, Director of Development and Strategy TJ Bliss, and LiAnna engaged in a four-hour workshop on strategic communications for our forthcoming fundraising campaign with our media firm, PR & Company. Based on the workshop, we’ve created a strategic messaging guide that we will use in conversations, LOIs, and other engagements with potential funders. 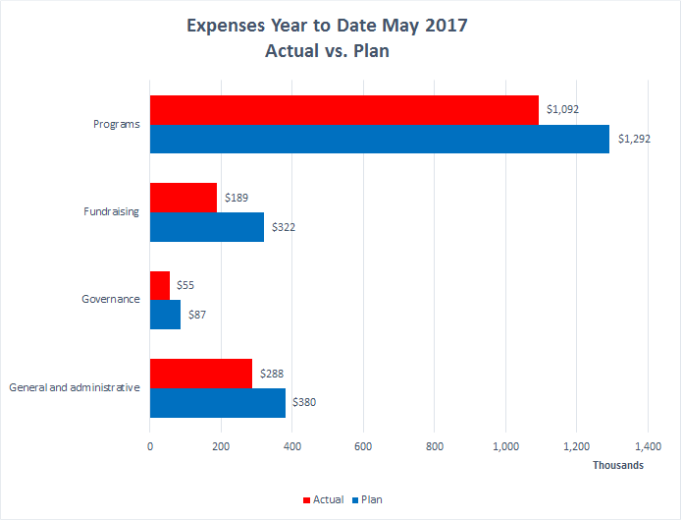 In May, Frank and the members of the senior leadership team finalized the first version of the annual plan and budget and sent it to the board. Board members then provided feedback via email and phone calls. The second and final version of the document was sent to the board at the end of the month. The board will vote on the 2017–18 plan and budget during its upcoming in-person meeting in San Francisco. Frank also attended board committee meetings and collaborated with board chair Diana Strassmann in planning the event in San Francisco. In preparation for next fiscal year’s major campaign, Frank met with Eric Newton, Innovation Chief and Professor of Practice at the Walter Cronkite School of Journalism and Mass Communication, Arizona State University. 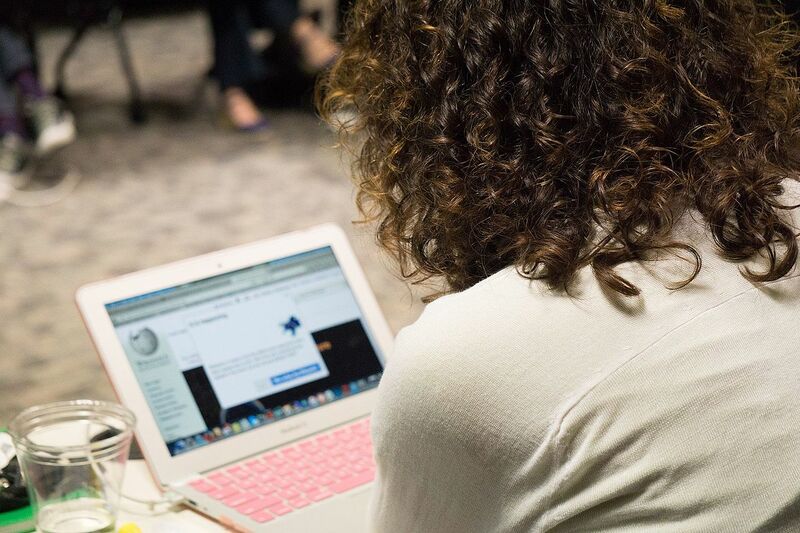 As a result, Wiki Education will partner with the Walter Cronkite School on a number of grant proposals. Frank also created and submitted a grant report and a letter of intent, and engaged with a number of existing donors. 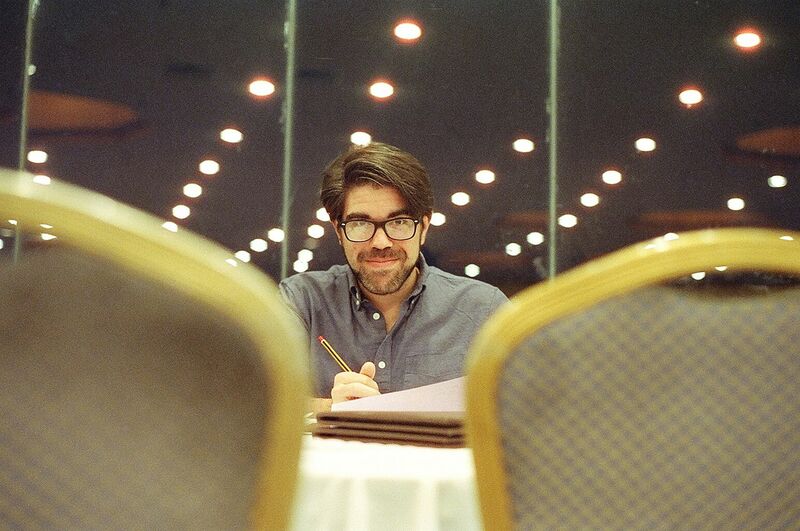 Starting in June, TJ Bliss will support Wiki Education’s development work. It is wonderful to see the contributions of Visiting Scholars reported on the blog. It is very encouraging when such work is highlighted.